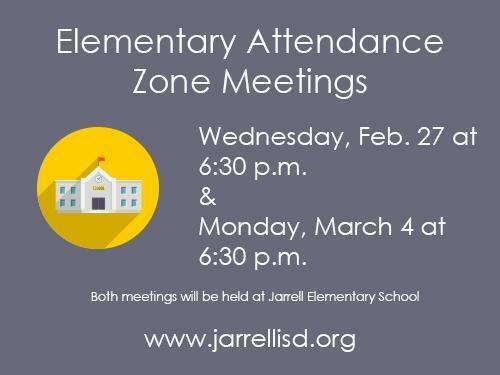 Jarrell Independent School District is hosting two community meetings to establish elementary attendance zones for the 2019-2020 school year. The district is preparing to make history and open its second elementary school in July. The meetings are scheduled for Wednesday, February 27 and Monday, March 4. Both meetings will start at 6:30 p.m. and will be held at Jarrell Elementary School (1615 CR 313 in Jarrell). 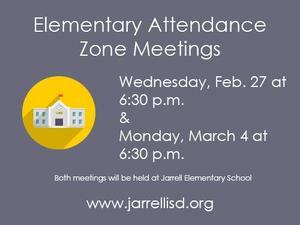 At the meetings, parents and community members will have the opportunity to review and provide feedback on options for attendance zones provided by the district’s demographer, Templeton Demographics. The Board of Trustees will make a final decision on attendance zones at the Wednesday, March 13 Board meeting. When the second elementary school opens, both of the district’s elementary schools will house Pre-K through 5th grade students. Currently, the district has one elementary school for Pre-K, Kindergarten, first and second grades; one intermediate school for third, fourth and fifth grades; a middle school for sixth, seventh and eighth grades; and a high school for ninth, 10th, 11th and 12th grades. The Board is expected to vote on a name for the new elementary school in February.